Posted September 20, 2018 by Andrea Laford & filed under Headlines, News. 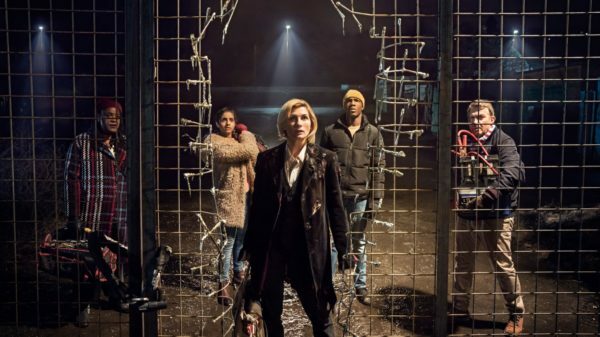 Official BBC synopsis: “We don’t get aliens in Sheffield.” In a South Yorkshire city, Ryan Sinclair, Yasmin Khan and Graham O’Brien are about to have their lives changed forever, as a mysterious woman, unable to remember her own name, falls from the night sky. Can they believe a word she says? And can she help solve the strange events taking place across the city? Guest starring Sharon D Clarke (Grace), Jonny Dixon and Samuel Oatley (The Warrior). Written by Chris Chibnall and directed by Jamie Childs. According to Doctor Who Magazine, the episode begins where Twice Upon a Time leaves off; with the Doctor falling to Earth ‒ in Sheffield. “The Doctor comes into contemporary Sheffield like a sidewinder. She literally falls from the sky,” stated showrunner Chris Chibnall, who explained his choice of location. “Sheffield is brilliant on a visual level but it’s relatively unrepresented in television series. This means that the character that you meet in the episode in a city that has never been in Doctor Who before,” he explained stressing that he wanted the location, like everything else in the series, to be relatable. One of the locations filmed in Sheffield was a house high up on a steeply inclined street overlooking Sheffield, the residence of Bradley Walsh’s character Graham O’Brien and his wife, Grace played by Sharon D Clarke. The characters are said to face a “ruthless alien threat over the course of an action-packed night”. 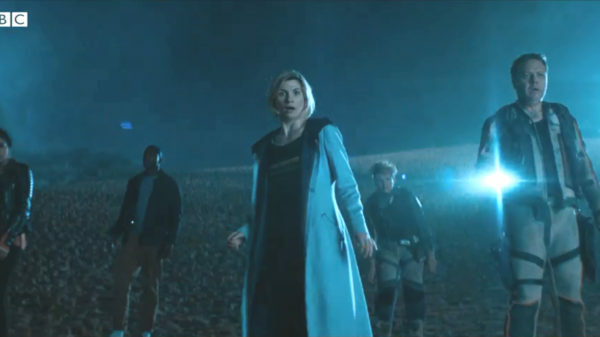 According to Chris Chibnall in Production Notes, the traditional opening title sequence, featuring music composed by Segun Akinola, will not occur in The Woman Who Fell to Earth and viewers will have to wait until The Ghost Monument to see it. Official BBC Synopsis: Still reeling from their first encounter, can the Doctor and her new friends stay alive long enough, in a hostile alien environment , to solve the mystery of Desolation? And just who are Angstrom and Epzo? “..the search for the mysterious Ghost Monument takes the Doctor and her friends far away from Sheffield…“ is how the magazine describes the second episode, which takes the Doctor and her new friends into space. Chris Chibnall describes it as having “more of a science-fiction, alien vibe”. “Our characters are stranded, and have to live on their wits, despite the fact that they’ve only just met.” is how Chris Chibnall describes their hostile, desolate environment, filmed at Macassar Beach Pavilion, an abandoned water park near Cape Town. A 16-page limited deluxe edition of Doctor Who Magazine containing a timeline of events from Peter Capaldi announcing his departure to The Woman Who Fell to Earth plus mini interviews with Jodie Whittaker, Bradley Walsh, Mandip Gill and Tosin Cole is available exclusively at WHSmith.